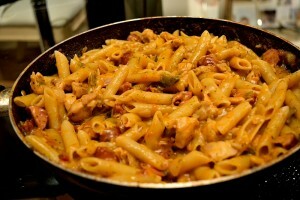 Chicken, sausages and pasta all cooked together in one pot! 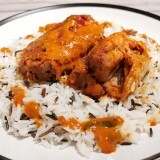 This is a recipe for serious eaters who enjoy rich and spicy dishes with aromas from around the world. Boiling the pasta in a separate pot and adding it to the sauce is one way to do it. You may end up with a boring meal, unless you are a maestro in the kitchen. 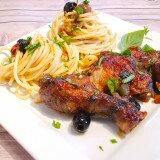 The other way is to cook the pasta in the juices together with the rest of the ingredients. Instead of having a bland taste, they acquire all the aromas and they become a part of a unique entity. 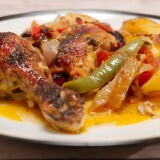 The taste of chicken and sausage blend quite well together. You might use bacon or lardons if you like instead of sausage. Be creative, it’s your meal and you can do whatever you want in the kitchen. I just share with you some ideas. 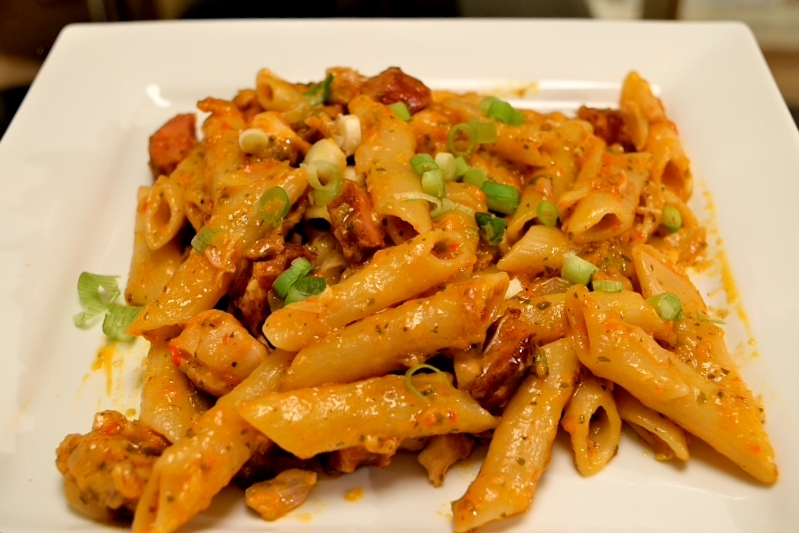 Delicious cheesy penne cooked in one pot with chicken and sausages. 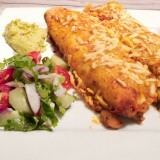 A hearty meal for serious eaters! 400 gr (14 oz) penne. 500 gr (17 oz) skinless chicken thighs. 1 green red pepper chopped. 1 yellow red pepper chopped. 1 red chilli pepper finely chopped. 1 ball of fresh mozzarella cut in thick pieces. 100 gr (3.5 oz) of Monterey Jack cheese. 3-4 cups of chicken broth (maybe a little more). 4 tablespoons of extra-virgin olive oil. 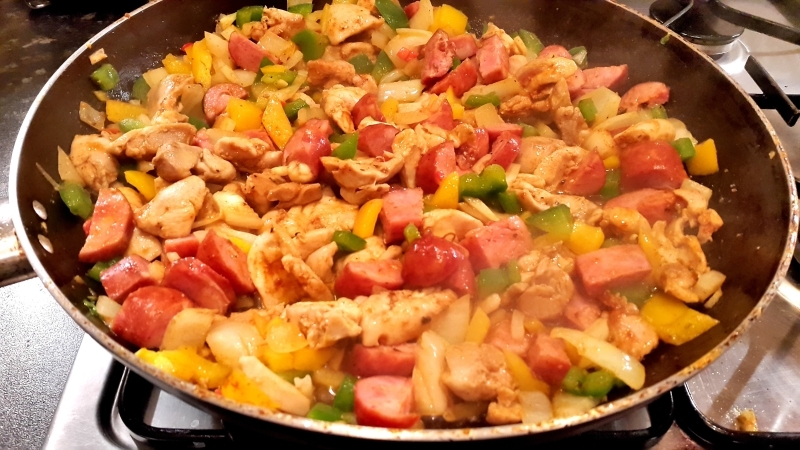 Cut the chicken and sausages in small pieces. Heat up the olive oil in a large frying pan on medium heat. Add the chicken and cook until it starts getting brown. Add the sausages, season with paprika, oregano, salt and Cayenne pepper and cook for another 3-4 minutes. 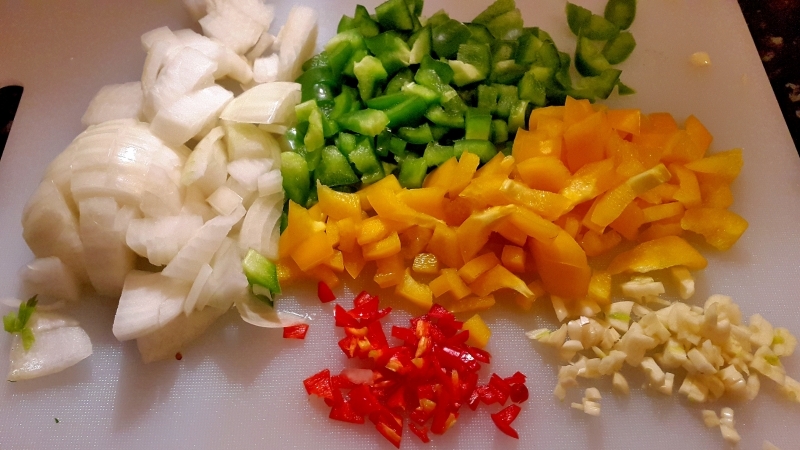 Add the onion, peppers and garlic and let them cook until the vegetables start getting soft. Give it a stir from time to time. Warm up the chicken broth and pour one cup into the pan. When it starts boiling add the penne, arrange well and make sure that they are covered with juices. If not, add as much broth as needed. Taste the pasta to check if they are cooked according to your liking. If not, add some more hot broth. When almost ready, add the mozzarella and pieces of Monterey Jack and stir well. Cook until the cheeses melt (1-2 minutes). Remove from the heat and serve hot with grated parmesan and chopped spring onions.